Regular readers of my blog probably know I'm very fond of bands on the Excelsior label and will have read about the band 'El Pino & The Volunteers' a few times in the past. One of the things I like is the one big family feeling of the record label and the way they encourage artists to be creative and come up with new collaborations and projects. 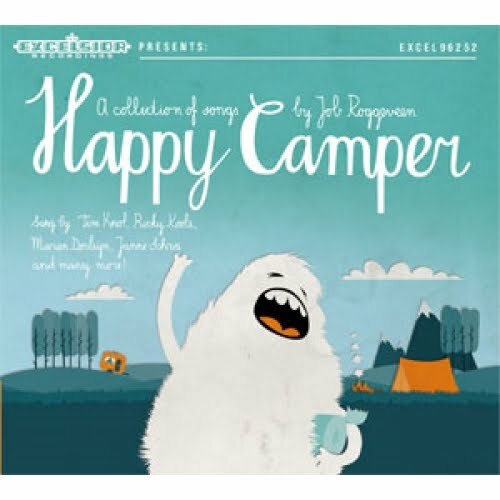 The 'Happy Camper' project is a perfect example. Job Roggeveen, keyboard player for El Pino, has worked on this project for three years. This month the album was released on the Excelsior label and turns out a musical journey filled with encounters with other artists. Just what you would expect from a happy camper. Roggeveen who is also a designer came up with the friendly yeti Manfred as the frontman for the project. And the video for the song 'Born With A Bothered Mind' featuring Bouke Zoete (The Kevin Costners) shows him on his camping trip. Both the song and video are typical for the album: beautifully arranged jaunty indie pop songs with a kind of gypsy twist. A violin fiddles around playfully in the music that perfectly matches the original and appealing cartoon animation. And so the album contains 14 atmospheric songs in the same sunny style. 11 songs feature guest vocals by an interesting selection of mostly Dutch indie singers and singer/songwriters like Tim Knol, Janne Schra, Ricky Koole and not surprisingly David Pino. This approach results in a nice variety in songs due to the different singing styles ranging from an agitated indie song like 'Run' with Johannes Sigmond (or Blaudzun) and country ('Stop Fooling Yourself' with Leine) to a melancholic ballad like 'All These Lousy Conversations' with Storybox's Helge Slikker. Although it's a totally Dutch project it certainly has enough international appeal. So listen to some of the songs and judge for yourself. And then of course buy the album over here! I can't wait to see Happy Camper and the Volunteers perform the album live in April with most of the singers on stage. And of course see more of Manfred's adventures in one of these great videos.